I was able get my blocks done for the Farmer's Wife 1930's Quilt Sampler very quickly, but getting pictures and writing this has been difficult. Between finding the time and chasing the daylight I finally got it done, I think just in time to link up for last week. So without further ado. I loved this block. I love the colors, the fabric I've got going on. And the fact that it came out the right size and most of my point lined up. I did paper piece from the printout in the book. Which I believe is why this came together so easily for me. I also paper pieced Nancy. I love the fabric in this, although, I am not sure it came out the best that I had thought it would in my head. Week 8 is almost ready to be posted, but that will have to wait until next week! Have a great weekend everyone! P.S. - If you'd like to follow me and see what else I've been up to, check out my Facebook or Instagram. P.S.S. -This quilt-a-long is being put on by Fat Quarter Shop & the lovely lady behind Gnome Angel with the help of some other amazing bloggers. Following the Farmer's Wife 1930's Sampler Quilt by Laurie Aaron Hird. 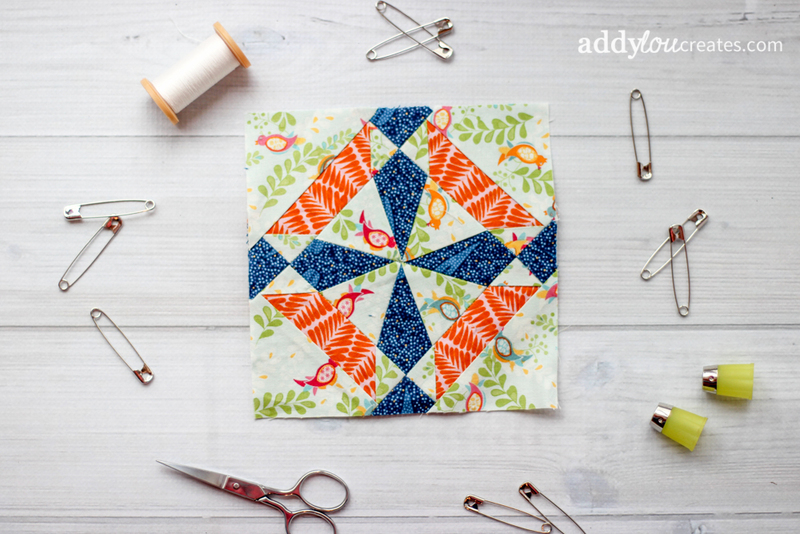 This pattern is from Cloud 9 Fabrics. It is a free design by Michelle Engel Bencsko called Scattered Petals Quilt. This was a very easy project to follow. Although I did modify it - you know because I can never leave anything alone. I changed it up to use the layer cake I had available. Cut each 10" square from the print layer cake into 4 - 5" squares. I used about 14 - 10" squares from another layer cake in plain grey for the accent squares. I cut each of the plain color into 25 - 2" squares. Then I followed the rest of the well written directions for assembly. One layer cake will have enough to yield two baby quilts with a few blocks left over. I used 80 blocks per quilt to give a 37" x 46" quilt. Perfect for a baby/crib quilt. You could easily turn this into a twin sized quilt by adding a few borders to make it the right size. As for finishing, I machine quilted using a diagonal pattern. I am offering this quilt in my AddyLou Creates etsy shop. The second one will be coming as soon as I find some time to get it sewn together. I am just in love with the colors on this. And how quickly it all came together. Binding | Navy blue broad cloth...had at home from another project. Hope you have enjoyed my rendition of the Scattered Petals Baby Quilt! Thanks for reading! Three blocks this week! Woohoo! We are now up to 15 of the 99 blocks done. Still a long ways to go, but making great progress. This weeks blocks were so much fun. And I didn't have to un-pick anything so that made this week all the better. This block I took my time on. Fussy cut the center and all the accent point tips. Probably took longer than it needed to take, but I love how it turned out. This block had some special meaning to me. My mother IS the 'Farmer's Wife.' And to top it off her name is Margaret. She is the most wonderful woman, mother, wife, friend ever! I happened to be over there the day that the block was released. We were supposed to be helping rack leaves at a Great Aunt & Uncle's house, but being the farmer's wife/mother & me the daughter, we were sent on an errand to help move grain trucks on our family farm. They were at the height of harvest, so off we went to help out. So as thank you for all that she does, I had her request the colors for this block. Her choice: Red & Black. I think I took care of that quite well. Throwing in the tractors, red gingham & black with silver dots (an ode to her beautiful silver hair...she's gonna hate me for that one) all makes this my mother's block. Milly is here. I liked this block. Although, I think my color combination may have looked better in my head. All in all, I like how it came out. I am really a fan of the simplicity of the triangles. These last two blocks came together so quickly and neatly. On to week 7! 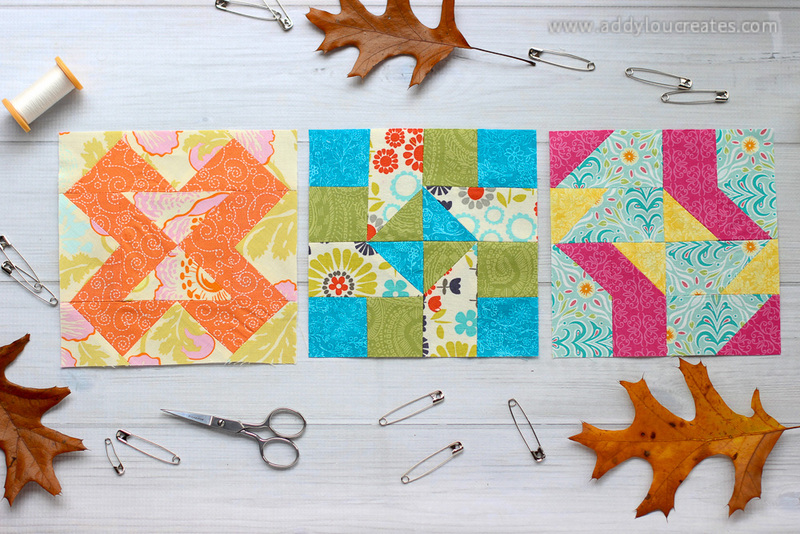 I am looking forward to the new challenges and seeing all the other blocks & fabric combinations from everyone else. Month two of this Farmer's Wife 1930's Quilt along is starting off wonderfully!!! Including this week's trio! This quilt is going to be totally random in colors, and I am loving how it is looking thus far. P.S.S.S - Linking up with Gnome Angel for her THE FARMER'S WIFE 1930'S SAMPLER QUILT SEW-ALONG LINK PARTY This week is Farmer's Wife 1930's Quilt Sampler BINGO! With blocks : #1 Addie, #8 Aunt, #16 Bonnie, #24 Coral and #94 Susannah. Another two blocks in the books! I am not sure I how I was able to get these accomplished with all the sewing for Halloween I did and not to mention, all the stocking orders I had waiting to be sewn. I got week 5's Farmer's Wife 1930's Quilt Sampler blocks finished. This block and I were not getting along as well as I would have liked. I used the paper piecing method for this one, thinking that it would help me keep seams straighter and make it go together easier. Not sure how or why I came to that conclusion after reading everyone else's posts on the block. But soon I joined the ranks of Granny's wrath. I made this one twice. The first time, I wasn't pay attention and sewed the block all back wards. The second time, I got it all together, and realized that there was a large cut in one of the blocks. There was no hiding it. So, I unpicked the first and put it together. It came out OK. Not sure on the choice of colors/fabrics I used. But it was done, seams matched up the best that I could get them to, and I was sticking with it. Jenny went together so much easier for me. I am pretty sure it took more time to pic out the colors than anything for this one. I am enjoying how the birds came to play in it and the colors. I used the templates from the book to make this block. Week 6 here I come! Hope everyone had a wonderful Halloween last weekend. Ours was great albeit a little cold and rainy. Though it didn't seem to bother the kids any who wanted to trick-or-treat no matter what. Wow! This week was exciting! Three more blocks done! Although not without some frustrations. That being said, I am happy with how all my blocks are coming together. Here are the blocks from week 4 since I am slightly behind posting, now that we are at the end of week 5. All of my Farmer's Wife 1930's Quilt Sampler blocks this week were cut using the templates from the book. Made from some Amy Butler and some other scraps. I love the colors on this one Although, for what ever reason, this one and I didn't get along well. The first time I made it, I gained a half-inch. Not sure what or how that happened. Second time was better, but still a little big. Oh, well. Quilting is not perfect, right?? Next came Susannah. I liked this one. It came together quickly and easily, after I figured out I had to cut each of the accent fabrics separately to have them all going the same direction. I used some fabrics that I have used in various baby blankets that I have made for my etsy shop. And one more this week! I like how this one came out as well. It again took me a bit to realize how to cut the fabric with the templates so that all the pieces would be the correct direction. This is made with scrap fabrics from my stash. Now on to write week 5's post. Have a wonderful Halloween all! Posts on the kids costumes to come! That is part of the reason I was behind....sewing costumes for five littles takes a lot of time!